12:30pm: And the speech is over. "He's ready to kick it," said White aide Bill Kelly. For our exit music, we get "Start Me Up" by the Rolling Stones. Stay tuned for full video of the speech in about 30 minutes. UPDATE: The video of the speech is available in boxes to your right. As usual with TT video, we recommend watching in full screen or at least a bigger window than the one in the side panel. 12:26pm: White's favorite topic, energy, is mashed-up into this new stump speech that has bits of the old. Really though, I've never seen Bill White seem this excited or animated when speaking to a crowd before. 12:23pm: Speech has now moved to values and ethics. White says members of his staff, if he's elected, will not be allowed to transition into "lucrative lobbying jobs". 12:21pm: We've moved onto White's record, which sounds a lot like the Senate race stump speech, and I only know because we recently gave it the Stump Interrupted treatment. White calls out "those for partisan reasons... who will seek to diminish" him and his record. "We should not put up with people who seek to tear us down," White said. 12:17pm: This is a pretty passionate Bill White, as Bill White goes. He's now shifting to the cost of electricity in Texas. "We pay more than the national average on electricity... I will fight to bring utility rates down in this state," he says. The general theme here is that Texas cannot be the leading state in the country if a. ), b.) and c.) is a problem. Now we're going through the a's, b's and c's. They include, as described by White: the cost of tuition, the cost of electricity, the dropout rate, lack of children's healthcare. "I know I don't have the polish or the fame of career politicians," White said. "I do know how to bring people together to get things done. I know and you know the difference between rhetoric and results, and don't you think Texas is ready for that right now?" 12:15pm: White's first issue in this speech: education. "We cannot be the leading state in the United States of America if we are dead last in the number of students who are graduating high school," White says. "Every time a young person drops out of school we oughta treat is as an emergency." 12:14pm: Elena and Will White (Mayor White's children) take the stage and introduce Bill and Andrea. 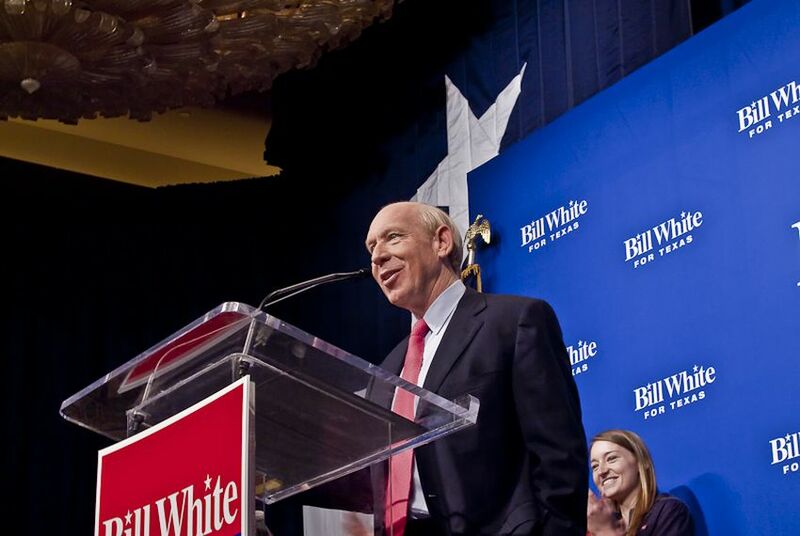 "I'm Bill White and I want to be the next governor of Texas," White says right away. The crowd goes wild. 12:09pm: All the intrigue among gathered press has now turned away from Bill White and back onto Farouk Shami, the haircare executive running for governor. Democrat Hank Gilbert announced he won't be running for governor, is switching to agriculture commissioner instead, but is ENDORSING SHAMI for governor. "With recent entries into the race, it's become clear that there are now two people seeking the support of Democrats who can continue this fight to victory and allow me to return to the race for Agriculture Commissioner," Gilbert said in a release. "One of them I'm proud to support as a friend and fellow Texan, a man who will serve the citizens of this amazing state faithfully and provide them with the leadership to overcome any challenge. It's my honor and privilege to endorse Farouk Shami for Governor of Texas," he said. 12:05pm: Notable Houston names in the crowd: State Reps Carol Alvarado and Kristi Thibaut, City Councilman James Rodriguez. 12:03pm: "As a journalist, this means more road trips!" KPRC-TV political reporter Mary Benton says of White's entrance into the governor's race. The Houston city hall reporters are all expecting to start traveling a lot more now that White's running for a more high-profile spot. They're already planning to come to Austin's rally for White this coming weekend. 11:57pm: Positioning of the people for TV cameras is underway. An announcer has asked the crowd standing BEHIND the TV risers to move into front and center. 11:55am: This event is not going to start on time. The city has sent out an email allowing employees to leave and go home early given the snowy sludgy mess outside. That means some city employees are expected to start showing up around here any minute. 11:49am: Andrea White and Elena White, the mayor's wife and daughter, respectively, are in the house. Elena gave us a quick HuTube interview that we'll post after the liveblogging adventure. 11:40am: We're in Houston, where snow is falling in significantly-sized flakes. It's not sticking to the ground but the wet coldness has some organizers concerned about turnout. The Hilton ballroom where this event is happening is pretty large and with about twenty minutes out, it's not filling up.